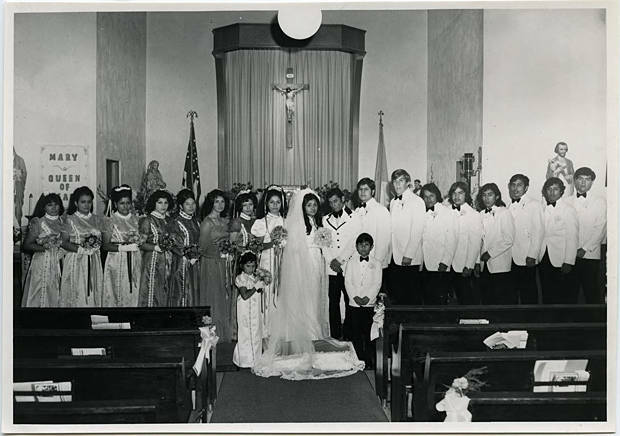 Black and white image of a wedding party standing along the front of a church. The bride and her eight bridesmaids stand along the left side of the image; the bridesmaids wear variations on the same dress with lace collars and trim, gloves, and all hold small bouquets. A young girl stands near the bride. The groom has eight groomsmen; they all wear white tuxedo jackets and black pants with black bow ties. A young ring bearer stands by the groom. In the background is a large curtain with a crucifix, flanked by two flags, one a United States flag and the other unidentifiable. See WCMpic_015040 for an image of just the couple from this wedding. This image is part of the Herbert McMullen bequest. McMullen was a local photographer who owned a studio in Hillsboro; he also collected images of local life taken by other photographers.